On New Year’s Eve, 1921, three men sit down to a poker game. The Great Jerusalem Poker Game, as it’s eventually known, continues for the next twelve years—the players unwilling to leave a competition whose prize is control of Jerusalem. The players are as exotic as the game: Cairo Martyr, a one-time African slave, now the Middle East’s chief supplier of aphrodisiac mummy dust; Joe O’Sullivan Beare, an Irish tradesman with a specialty in sacred phallic amulets; and Munk Szondi, an Austro-Hungarian Imperial Army colonel turned dedicated Zionist. But before the final hand is played to determine the destiny of the Holy City, a dangerous new player enters the picture: Nubar Wallenstein, an Albanian alchemist determined to achieve immortality, and heir to the world’s largest oil syndicate. He finances a vast network of spies dedicated to destroying the players, and his aim is to win complete power over Jerusalem. 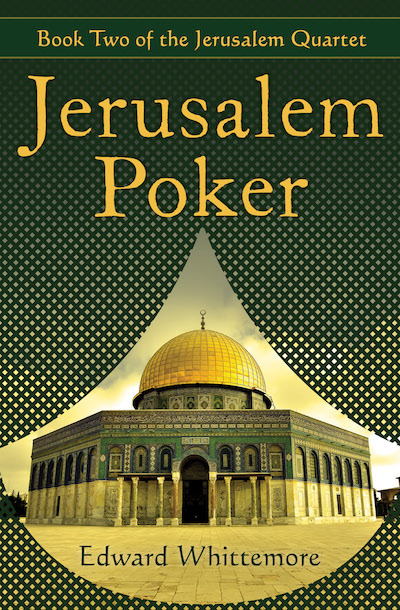 Jerusalem Poker is the second volume of the Jerusalem Quartet, which begins with Sinai Tapestry and continues with Nile Shadows and Jericho Mosaic.